This style helmet appeared in the late Medieval and Renaissance eras. 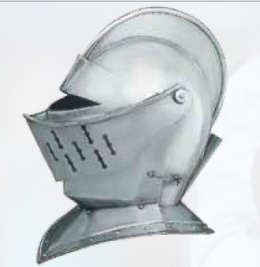 It was considered the classic "Knight's" helm and typically worn by knights and other soldiers of the time. The visor and bevor are pivoted from bolts on each side of the skull. Our model is made of 18 gauge steel and feature brass rivets. Whether you're playing a knight or simply adding to your collection, this is a perfect choice! This page was last modified on 13 May 2014, at 14:12.